So I decided to travel a #500 distance from my School (Nnamdi Azikiwe University Awka) to my Hometown in Nnewi. I took a bus from my Hostel to the Bus stop at Unizik Junction. Before the Driver arrived we had to wait for Other Passengers to join us . While we were waiting for Other passengers to join the bus, we were occasionally entertained by different sets of 'beggars' asking for alms using 'soulful' Christian songs as their Background beats and touching already seated passengers saying 'Biko ye Mummy m aka'. I was slightly irritated because while growing up the only people that beg for alms at Bus Stands were Mainly 'disabled' People but the Beggars here are just Sound . We left the Bus stop in Awka at about 16:23 and we headed towards Nnewi. I bought a can of Lacasera drink for #120 and 2 Sausages for #100 (before the Recession,I used to buy Lacasera drink for #100). We prayed to God for Ijeawele and we went on to Cover the Major Roads and HighWays with the 'Thick' Blood of Jesus. The Roads were Smooth and the Traffic was less than Anticipated and Finally we got to the Nnewi Park. I bowed my Head to Thank God for Granting us a Successful Journey as we've Prayed. 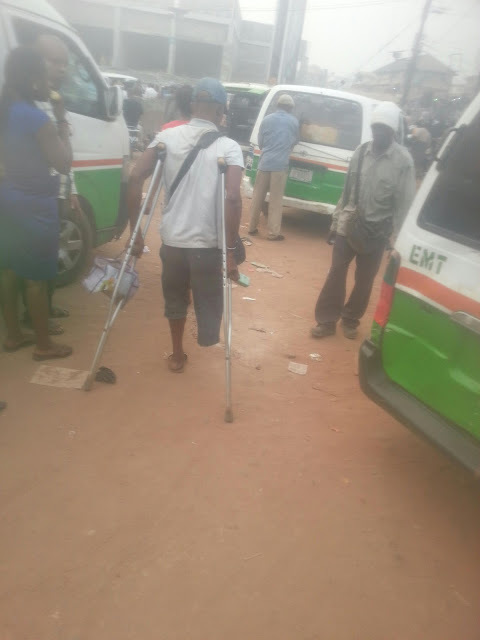 I finished Praying only to Raise my Head to see a Man with one Leg,the other one was Amputated. 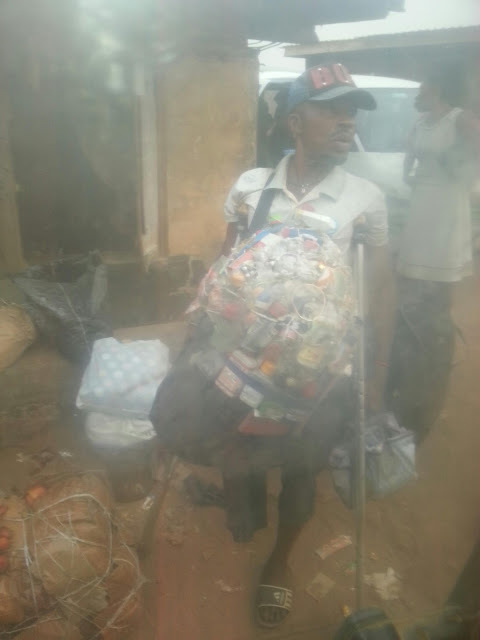 What struck me Most was not his Crushes nor his Beautiful trousers that doesn't fit perfectly but it was the Load he was carrying on his Neck and biding on us to come and buy goods . I was stunned and at the same time I was Struck at this Man Courage and Strength. 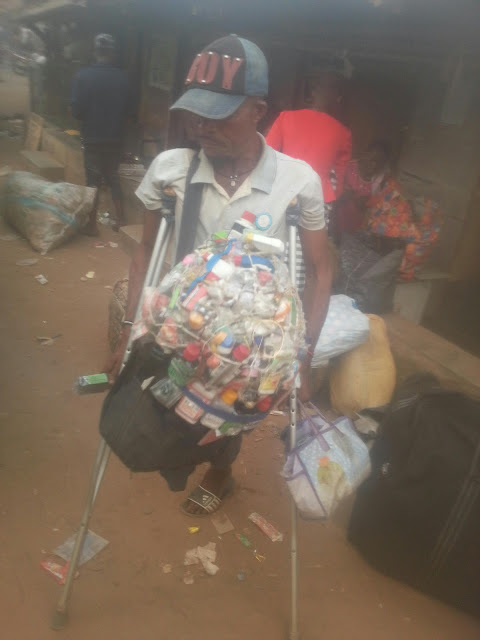 A man who has the Perfect Badge of a Beggar decided not to Beg and about an Hour ago I saw able bodied Humans doing what this Man is expected of Society to do. Disability Optimization comes in two Forms; either you Maximise it or you Allow it to Minimise you. I was happy to know that we still have Igbo Brethren who are still Hardworking despise all Odds until they Achieve their Goal. Some People always have excuses for Failure but I don't think that's the case of this Man. Despise all Physical Odds he never saw a Disability but an Ability to Market. I wasn't able to Chat with the Man but before I leave from my #IjeUlo I was make sure I know this Man Personally. And to my Igbo people Ndi biara #IjeUlo please try and Patronise this Man .